Chalcedony is a broad gemstone family of many varieties of cryptocrystalline quartz gemstones. 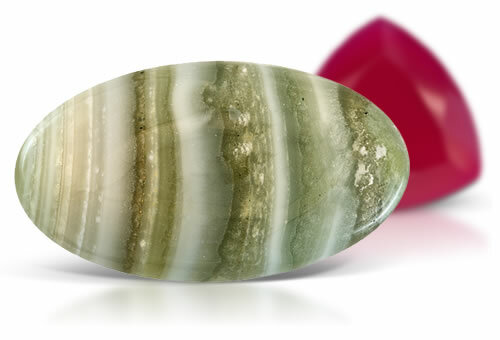 Chalcedony usually has a waxy luster and appears in a great variety of colors including blue, white, buff, tan, green, red, gray, black, yellow or brown. Different colored varieties of chalcedony have individual names including agate (banded), bloodstone (green with red spots), chrysoprase (apple green), carnelian (orange to red), flint (dull gray to black), jasper (spotted red, yellow, brown or green) and sard (light to dark brown). RI, SG, appearance and fracture. Color filter if dyed. Misnomers: black onyx is black dyed chalcedony, green onyx is dyed green chalcedony, moonstone for milky chalcedony. Chalcedony is frequently dyed so look for dye concentrations. Dyed green chalcedony is evenly colored slightly blueish green and will lack dye concentrations.